"It has been a pleasure and an honor to tell everyone how wonderful it was to work with Noah’s Park and Playgrounds. The whole team was wonderful. I know Jim put in a ton of work on our behalf and I’m sure others went the second and third miles as well. I certainly recommend you to everyone who asks. Our kids absolutely love all the playgrounds. My son absolutely loves them! In fact, I think parents are happy their kids love all the playgrounds (both indoor and outdoor), but they’re not happy with how hard it is to get their kids to leave! Your team’s work is a significant part of our building that is intended to bless the lives of others for generations to come. We believe it is important to invest in our children spiritually, emotionally, intellectually, and physically. Your work helps us toward accomplishing that mission." "Jim and the rest of the Noah's Park team went over and above traditional levels of customer service. Their knowledge of not only the products they sell, but they have access to other products that may be available to meet your needs. 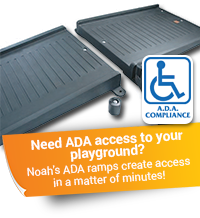 I would highly recommend Noah’s Park & Playgrounds to any organization seeking not only the best options for playground equipment, but also the best customer service to support their client’s needs. This is truly a one stop, first class company and incredible source for playground equipment!" "We LOVE our playground!!! SandRidge Energy, Inc and Noah's Park & Playgrounds, you all have made our students, staff, and families so incredibly happy!!! Thank you for creating such an incredible structure for children of all abilities!!!" "We are very happy with our playground. It looks amazing and our preschoolers are so happy to have an outdoor space to use at our church. Brenda was so helpful in answering questions and very patient as I tried to decide exactly what we would need and want and even changed my mind. It took us several months to finalize our order and there was never any pressure, which made the whole experience even better!" "Noah's Park & Playgrounds was an exceptional company to work with. We are so pleased with our new playground. We have received so many compliments from our residents!" "Thank you so much for working with the City of Pilot Point. It has been such a pleasurable experience and we will definitely be contacting you on future projects. Your product and assistance are flawless." "Our playground equipment has been a HUGE success with all of our students. We love the fact they are students are exercising yet they do not even know it! They are having so much fun!!! Noah's Park & Playgrounds was so easy to work with and we can't wait until we start our next project with them." "It has been a pleasure doing business with your company! You are amazing!!! There are so many places to get playground equipment and we are so happy that we chose you!!! Thank you for all of your help and ideas! We will be back for more!!!! Thank you again for everything!" "I'd like to give a big thanks to Seth and his installation crew that came out and did a phenomenal job with the basketball striping portion on my decorative acid stained basketball court project for Voice of Hope Church in OKC. And to the top-notch folks that made it prompt and easy to schedule, many thanks! Looking forward to working with you all again!" "Super people that were extremely helpful with all of our quote requests, pricing issues and installation! They went over the top on installing our equipment!" "I enjoyed all of my communication and dealings with Noah's Park. Sharla [NPP Sales Rep] worked with us to understand our needs and made several trips to our park to discuss in person. She made a plan to complete the work that was essential and provided vision for how would could improve our playground in the future. The materials arrived quickly and installation was done promptly. I did not receive any communication from the installation team regarding the timeline of work, but it was done so quickly I didn't mind. I was especially pleased with the way the installation issues were resolved. A wonderful experience overall." "I just wanted to let you know I walked out 'into the middle' of the newest playground equipment Noah's Park installed at Centennial (where I teach) and was amazed at the joy on 174 kids faces! They were jumping, twirling, climbing, spinning upside down having the time of their lives! I told our principal today that the equipment has to be one of the best purchases they've ever made. I thought you might want to know how much fun your products are!" "I love the people from Noah's Park & Playgrounds. They are always extremely helpful and come at the drop of a hat when we need them." "Fantastic staff; All were very helpful and patient. Great Customer Service! Thank you for all of your help on our ongoing playground updates! Your company has made this whole process very easy at a time of year that is extremely busy for me and our business office. We look forward to continuing using your company!" "Quality products and professional courteous service." "I am using the 12 in border timbers to make a raised garden. The initial shipment was missing six spikes. They were shipped the same day I called. The Rep was apologetic and courteous. I would not hesitate to recommend Noah's or buy the product again at any time. Excellent product, excellent service." "The folks at Noah's Park & Playgrounds are just awesome to work with. Great service! We will definitely use them again." "Excellent company delivered what they said when they said. Answered all my questions." "Excellent product! Beautiful addition to our school playground that will provide years of enjoyment!" "Shan, Miss DeAnn, Jim and your crew- Just wanted to say thank you to you guys for all your help getting ready for that Health and Safety review in a timely way last year- it paid off!!! Thanks again!" "I called Noah's after looking at their website and made my selections. They shipped the product to me the very next afternoon. The customer service was excellent." "Sharla [NPP rep] is GREAT always very helpful and pleasant. Goes over and beyond. Gets back to you quickly even after business hours if need be." "The customer service was very helpful and courteous. I will definitely order from them again!" "The customer service was fantastic. Loved the moke ups that were sent and double checked, to be sure we were getting what we wanted." "Service was quick and very easy. Thanks"
"My product was just what was needed. Thank you!!" "The service rep. was excellent. I was searching for parts for a circle cycle. She helped me find and shipped what are becoming obsolete parts. My wife teaches at a preschool. The kids love the early model circle and over the last several years the manufacturer sold out. Brenda was extremely helpful and prompt." "I was happy to find the replacement parts I needed, and very much appreciate your help with getting the parts to us quickly and for a reasonable price."